Although our week on the Big Island of Hawaii is nearing its end, I managed to incorporate our visit to Volcanoes National Park into the Weekly Photo challenge: Weathered. Where did the sand of the famous Black Sand Beach at Punahu’u come from? Weathering is the change of appearance or texture of dried lava rock over countless eons of exposure to the elements. Most folks know that the island chain of Hawaii was created over tens of thousands of years of volcanic activity, which continues to this day. In fact, the volcano, known as the Kilauea Caldera, is active and attracts millions of curious tourists each year to the Big Island. 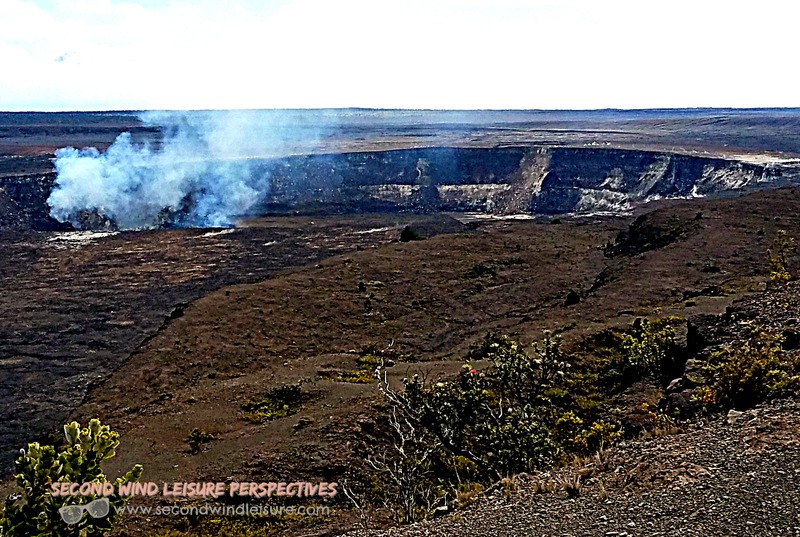 A look at the Kilauea Caldera over three miles wide. Another crater within the caldera spews out sulfuric steam through it’s vents as water enters cracks in the rocks and comes in contact with the magma. When a weakness in the Earth’s crust causes an eruption, the lava flows over the land and into the ocean. As it cools it leaves curious shapes that gradually erode over time. Some of the lava rock is used for fencing and landscaping, being an abundant, natural, and inexpensive resource to use. Like any natural element, it continues to weather over time, as shown on the lava rock fence below. This photo was taken at the historic Volcano House across from the Caldera, the steam vent seen in the distance. 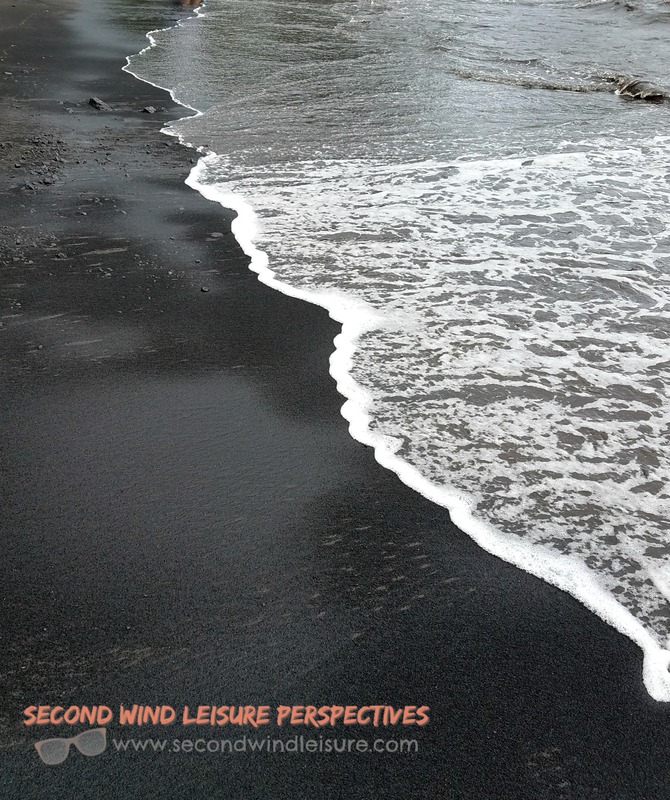 There are a few black sand beaches on the Big Island and one on Maui, all near volcanic sites. The weathering process of the air and ocean water eventually breaks the lava rock down into fine sand that inevitably finds it’s way under the soles of your bare feet, as featured in the image above. The lava flows in this area are considered the southeast rift zone of Kilauea which flows toward Punalu’u beach This sand was silky soft and amazing to see and feel. 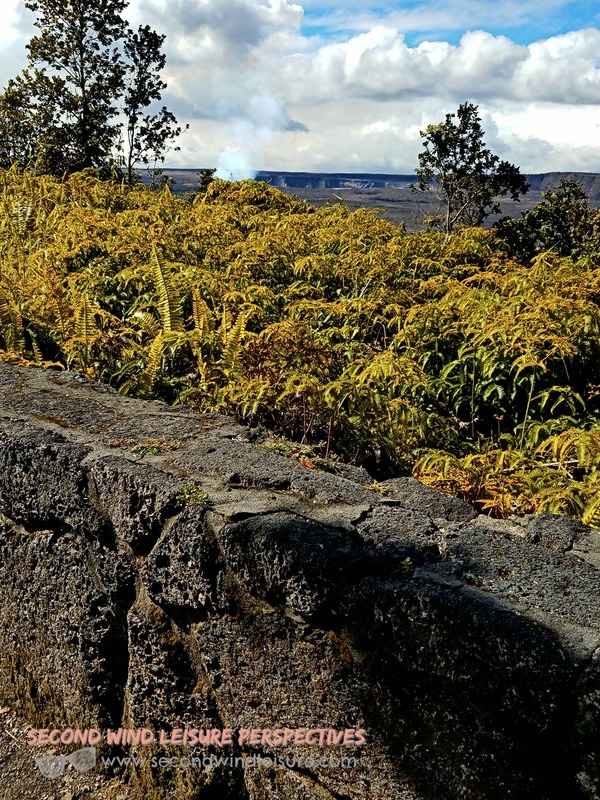 For native Hawaiians, the Kilauea Caldera is the home of Pelehonuamea–Pele of the earth–the goddess of fire and volcanoes, and the creator and rejuvenator of new lands. Plaque at Hawaii Volcanoes National Park. Visiting the Big Island (anywhere in the Hawaiian Islands) has long been on my bucket list. 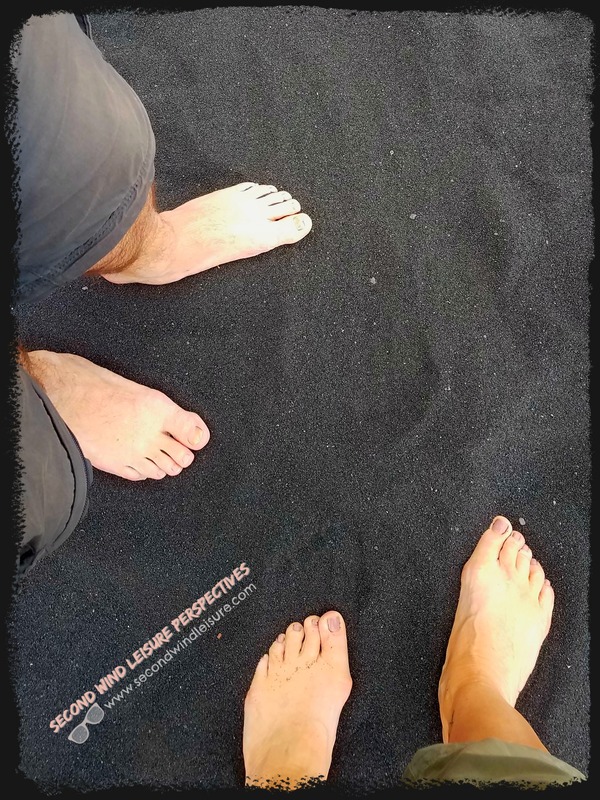 Feeling the black sands beneath my toes was another. A few more items have been checked off, too, so stay tuned! What a wonderful thing to experience, Terri. Certainly something I’ve never seen. Given that many beachgoers enjoy golden sands, I wonder what it’s like to sunbathe on a beach where the sand is black? I would imagine that the sun heats the sand up very quickly given that black absorbs heat quicker. Does it stick to your feet just the same as golden sand does? I wondered the same thing, too, Hugh, and yes it seems warmer and sticks to your feet the same! Beautiful photos, Terri. I love the Big Island with its volcanoes and black sand. My husband and I watched the Ironman there a few years back. That was pretty exciting too. Thanks, Christie, I would have loved the see the Ironman! I’m glad you got to visit the national park, Terri. I’d love to go there one day as well. In the Caribbean, there are several black sand beaches. And, on Martinique, there is a volcano named Mt. Pelee. I wonder whether the goddess has something to do with that! Looks like you had a very nice visit to the Big Island! It was an amazing vacation, Liesbet! With Hans’ house there in Hilo needing repair work, we have good reasons to go back more often. It was a cool experience! Thanks, Aixa! Thanks for stopping by Jennifer! I hope you get to go some day! Amazing Terri – I’m always fascinated by anything to do with volcanoes. I’m glad you had such an awesome experience in Hawaii. Thank you Tina! I’ve now been to two islands, Oahu 12 years ago. Both beautiful and have their distinctive characteristics. Hope you can go some day! Aww, thanks, Lisa! Sad to be leaving and getting back to the cold north and reality! I kick myself i forgot my real camera, but my phone worked ok. Thanks, Lynn! Gorgeous. I visited a ‘volcanic’ black sand beach in St. Lucia once. The dark coloured sand makes the sea water their gorgeous deep blue. My favorite Hawaiian island! When I was last there, the lava hadn’t reached the ocean yet. I love the Hawaiian name for the jagged solidified lava: a’a (pronounced ah ah) because it’s just what we probably say when we walk over it in bare feet. What interesting information. It sounds like a fabulous trip. I have never seen a black beach. I have been to Oahu and Kauai, but my husband is itching to go to the big island. It won’t be too hard to convince me! Have fun on the last of your trip! We’re having a wonderful time. I needed a winter with some sun. The big island is amazing. We’re on the Hilo side which is less touristy and more laid back. 30 minute drive to the caldera. Kona is on the other side, and rockier and drier. Hope you get to go some day! These pictures are fascinating, Terri. A very interesting post. Great pictures of an unique area. 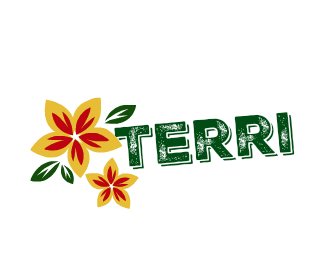 Hi, Terri – I am so glad that your trip to Hawaii has gone well, and that you have been able to feel the black sand through your toes, and experience items on your bucket list. Thank you for the informative post and great photos! It’s been a blast, Donna, but plenty of unscheduled down time here in Hilo. Sadly it ends Saturday as we spend the whole day driving to Kona then flying to San Diego…then driving home Sunday. If ever there was a great time to be away from the US, this was it! Lucky you for having the perfect subject for the challenge in a perfect place!! Thanks, Tina, I wish we could stay longer! That’s so amazing, Terri!! I bet you’ve had a blast with your photography at such locations!! !